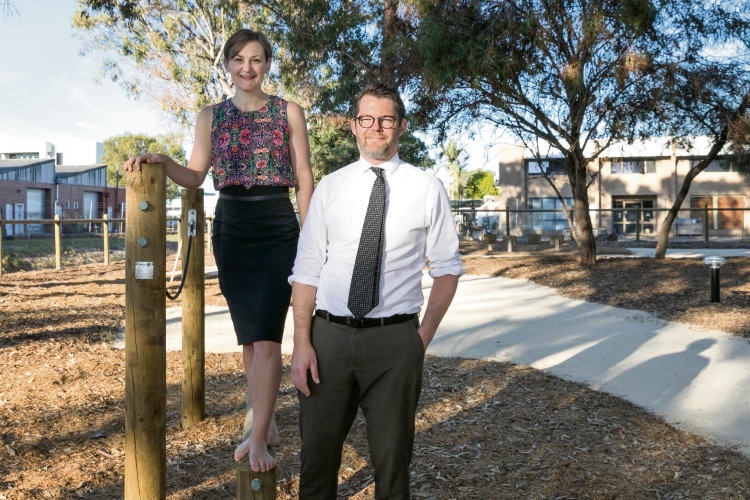 A FORMER disused drainage site at Russell Street Park has been transformed into a ninja-warrior style obstacle course located in the “heart of Morley CBD”. Bayswater Mayor Dan Bull, Morley MLA Amber-Jade Sanderson and Water Corporation chief executive Sue Murphy officially opened the 10-station obstacle course this morning. The City of Bayswater received a $87,000 Lotterywest to build the course, while the Department of Biodiversity, Attractions and Conservation contributed $50,000 towards the conversion of the area alongside the existing drainage basin into living streams. The site is owned by the Water Corporation, which worked with the City on the project. Cr Dan Bull said the fences have been removed for the public to enjoy the wetland area and obstacle course. “I am confident the 10-station obstacle course complete with a ninja-warrior style wall will be a hit,” he said. “There is a lot more work to do in terms of rejuvenating the area into a living stream. Cr Bull said the City’s longer term vision for the park would take shape over the next five years. In 2010, the council adopted its Morley Town Centre Master Plan, which identified the park as a “central essential park” that was vital to the revitalisation of the Morley City Centre.